This Is So Cute! Children Clean The Floor As They Learn To Crawl! The mop is made using ultra absorbent materials and engineered to clean and shine your floor. Designed for easy on and off. Baby Mops make great baby shower gifts. It is Baby unisex Onesie made of high-quality cotton, soft and comfortable, no harm for your baby's delicate skin. It has 3 sizes, suit for 6-18months babies. Crawling is very helpful to improve the baby's intelligence and physical exercise. Your Baby Will Look So Cute - With its cute design and cleverly-placed mopheads, the baby mop romper and onesie will look adorable on your little one. Friends, family, and strangers will smile every time they see it. The Perfect Baby Shower Gift - The unisex romper is the perfect "gag gift" or novelty item. It's guaranteed to be the talk of the party. And the baby can really wear it! This gift is good, clean fun. Comfortable for Baby - Made from a durable cotton blend, the long-sleeve onesie is comfortable for baby to wear all day. 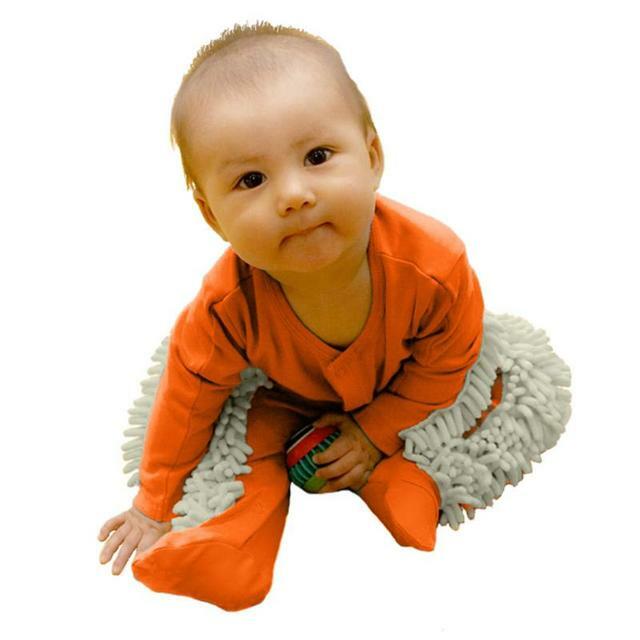 The mini-mopheads provide a nice cushion for your little one. Makes crawling fun. Comes in A Variety of Colors - Choose your favorite!